Back in November, Universal Pictures' Donna Langley revealed some surprising news. 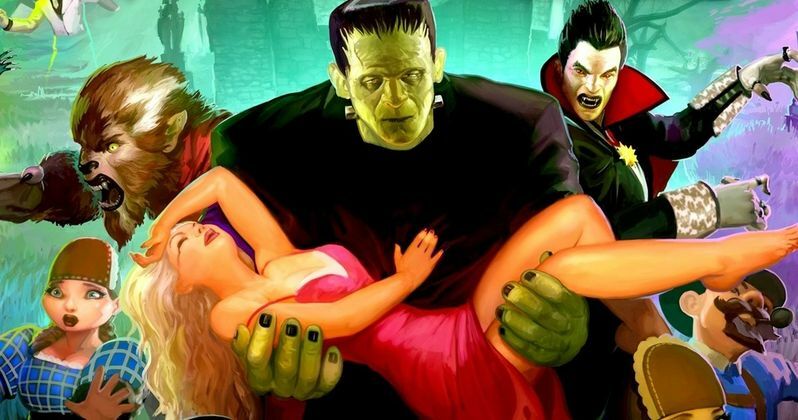 The Universal Monsters Shared Universe being developed by the studio will not be part of the horror movie genre. Instead, this franchise, which will include the upcoming Untitled Mummy Reboot and several of the studio's most iconic horror movie characters, was described as "epic action adventure". This gave many fans pause. While doing press for his new CBS TV series Limitless, Alex Kurtzman clarified that the Universal executive's statement isn't entirely true, and that these will certainly be horror movies. "Yeah, I think it's a fair response and it's actually not - I think there was some lost in translation quality to the way it was received, because I promise you there will be horror in these movies. It is our life goal to make a horror movie. The tricky part is actually how you combine horror with either adventure or suspense or action and be true to all the genres together. In some way, Mummy, dating all the way back to the Karloff movie, was the first to do that. It was the first to combine horror with - I wouldn't say action, but certainly a lot of suspense. So it's more about how you blend the different elements and stay true to each one, but there will definitely be horror in the monster movies. We will hopefully serve it up good and plenty." Universal recently shifted the Untitled Mummy Reboot from a June 24, 2016 release date to March 24, 2017, with an unspecified Universal monster movie shifting from April 21, 2017 to March 30, 2018. Alex Kurtzman and Chris Morgan (Furious 7) are overseeing a writers room that includes Noah Hawley (Fargo TV series), Aaron Guzikowski (Prisoners) and Ed Solomon (Men In Black) and Jay Basu (Monsters: Dark Continent). Despite the Untitled Mummy Reboot being delayed for nine months, Alex Kurtzman revealed the franchise is coming together quite quickly. "The monster universe is coming together very very quickly, we're very excited. There will be announcements soon. We have actually started doing a lot of design work, we're getting scripts in, everything is feeling really really good, so I don't want to curse it by saying too much to you, but it's going well." Both Alex Kurtzman and Chris Morgan have backgrounds in TV writing. Alex Kurtzman worked on Lost, Fringe and many others, and Chris Morgan created last year's drama Gang Related. When asked about the benefit of having multiple writers working on this monster franchise at once, Alex Kurtzman had this to say. "Coming out of television and having come out of writers rooms, the thing that I got out of it, and that I learned so much from the experience of being in the writers room, is that there's always sort of one or two singular voices to the show, but it's great when you have a group of writers who are talented in their own right coming together to build a world. We very carefully selected writers who - each of them have their own incredible careers. All of them we admire hugely. Chris Morgan is my partner in this and we all picked people that we've worked with before, people that we really liked, people whose work we admired, people that we didn't know, and really thought long and hard about which writers felt right for each monster. So our goal is to have each movie retain the identity and the individuality of the specific monster, but you'll see how they start to fit into a larger universe as the movies unravel." Are you glad that the Untitled Mummy Reboot and the rest of the projects in this franchise will be fully rooted in the horror genre? What other classic Universal monsters do you hope are brought back to life on the big screen by Alex Kurtzman and Chris Morgan? Let us know what you think, and stay tuned for more updates.